Passez une journée dans la célèbre nature sauvage du Costa Rica lors de cette visite guidée en véhicule tout-terrain au départ de la côte de Guanacaste. Suivez votre guide sur les rivières, à travers les épais feuillages de la jungle, passez devant des cascades, et bien plus encore, tout en approfondissant vos connaissances de la faune et de la flore le long du trajet. Cette excursion comprend tout le matériel et les instructions de sécurité ainsi que le transfert depuis l'hôtel à votre hébergement de Guanacaste. Favian was a great guide and gave us a choice of where we wanted to ride. We saw a variety of different terrain including riding through rivers, which was super fun. Ended up being a private tour with just me and my boyfriend. Worth every penny. Highly recommend! This was very fun and the tour guides that led us on the trail to the waterfall were great. We rode on a trail part of the way and through river beds and rocks. We saw a beautiful waterfall and stopped to take pictures and then we rode back. All was great and this was the best part of my trip. I really liked this ATV ride. Also, where we started we got to see the monkeys, which was great also. My wife and I really loved this excursion! 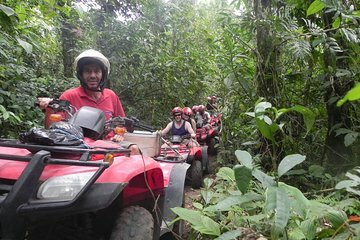 It was about 2 hours of ATV time 1 hr in each direction and we traversed many small streams and saw some howler monkeys on the way too. Our guide Luis was great and made sure we were well informed before we started and felt comfortable on the ATV. We both rode individually and were glad that we did. The waterfall halfway point is pretty small but still a nice place to rest before heading back. They provided water at the break which was nice. Also on the premises is a cool souvenir/snack/drink store and many white faced monkeys that are tame and all over the place! Shuttle service from our place in Playa Hermosa took about a half hour and was great van with ac. I'd do this excursion again if we came back. This tour was amazing from the beginning to the end. Very professional service and a exceptional tour. Upon our arrival, our group selected the Jungle Tour the other selection was the city tour. If your into adventure, this is a great tour. You will ride through muddy paths and see beautiful jungle views. The water-fall was amazing, so wear a swim suit. You will get very dusty, so don't wear any good clothing. Highly Recommended and the price is great! The tour was amazing, we had a good and patient guide. My kids loved it, I would highly recommend you try it! This was a good ride. It is guided, which is helpful because we wouldn't know where to go, and it crosses many muddy obstacles. It goes through a small rural town. The best part was getting to the waterfalls. All in all, I'd do it again. I only didn't give it 5 stars because my group did so many adventurous things in Costa Rica that this seemed a bit casual for me. Still though, I'd do it again.